[0:12] <Twist> ooer. I haven't been paying attentino. [0:12] <Twist> that Zero W looks great. [0:16] <Twist> Is $4 an insurmountable hurdle for you? [0:17] <infect> W just comes with bt and wifi right? [0:17] <infect> just wifi then? [0:21] <Twist> They don't need a pi either, though.. a wemos d1 mini fits the bill nicely. [0:24] <Twist> Is there any intelligence in an OTG adapter? or can I desolder the USB port on the mini and just hard wire a cable to it? [0:26] <Twist> infect: it's a reasonable question.. what would you do with a Pi that you couldn't accomplish by running a virtual machine on your existing laptop or desktop computer? [0:26] <Twist> The answer for many is embedded use, or hardware interfaces. [0:26] <Twist> Then you get into the question of whether a microcontroller might be a better fit. [0:27] <Twist> Or "extremely weak processor that can switch high currents"
[0:28] <Twist> Can't "It's fun to learn new things" be enough motivation? [0:30] <Twist> The major thing the Pi has going for it is the size of the community. You can more or less google "raspberry thing I want to do" and hit well written walkthroughs of said thing. [0:31] <Twist> infect: are you in a major metro? [3:40] <drjam> so much stuff to buy? so many projects to try? [3:41] <kaosine> and my wallet is like "you can't afford any of this"
[5:20] <GamingX2005> Hi, I'm trying to SSH into my raspberry pi on my local network, but the operation seems to time out when I try to SSH using Putty into it. I'm able to VNC into it, just not SSH. I've already enabled the SSH server using raspi-config. Any pointers ? [5:20] <mattwj2002> GamingX2005: reboot it? [5:23] <GamingX2005> mattwj2002, no luck. Is there normally a firewall on the raspbian ? [5:30] <mattwj2002> GamingX2005: what about upgrading all your packages? [5:46] <mattwj2002> GamingX2005: do you know about tab complete? [5:47] <mattwj2002> any of that work? [5:49] <mattwj2002> GamingX2005: did you restart yet? [5:49] <mattwj2002> socket all ready in use? 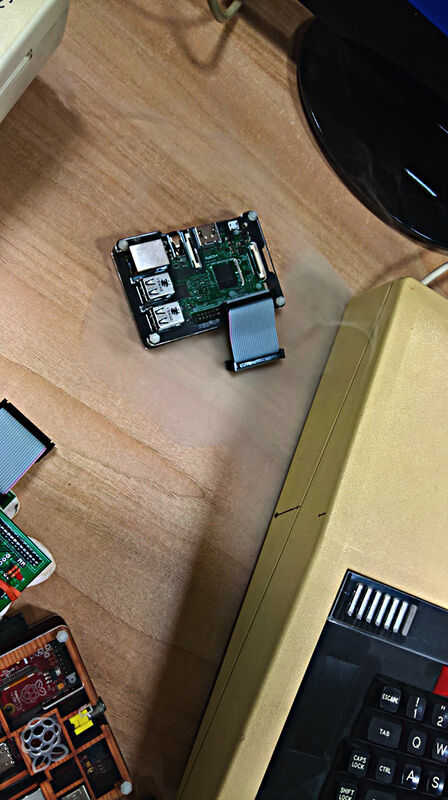 [6:17] <dbmonkey> Have they yet found a way to turn off the red led power light on a Pi 3? [6:41] <Sapio> lol. I used blue masking tape. [8:32] <python476> are buck converters stable enough for rpi usage ? [8:41] <python476> as in usb phone chargers ? [8:58] <python476> even with that small amount of basic components they may be frail ? [9:15] <mistralol> Emilio_: broken cable? [9:15] <mistralol> Emilio_: loose cable? [9:17] <Emilio_> and the Pi is running headless, is there soething specific that would help? [9:18] <mistralol> Emilio_: are any of the errors etc... non zero? [9:18] <python476> Emilio_: is USB used heavily ? [9:20] <python476> what about temperature ? or the ethernet hub ? [9:20] <mistralol> Emilio_: so you see rx drops etc...? [9:33] <mistralol> Emilio__: did you try a different port or switch? [9:37] <koramas> hey, anybody familiar with the ircd-hybrid IRC server? [9:44] <Emilio__> Would you know how to troubleshoot a switch that's failing negotiations? [14:56] <ShapeShifter499> does a raspberry pi zero v1.3 still work as a FM transmitter? [14:59] <ShapeShifter499> https://github.com/rm-hull/pifm is this not valid? [14:59] <ShapeShifter499> did something change? [15:07] <ShapeShifter499> mfa298: I don't know too much about radio. What makes it illegal exactly? Is it too powerful? [15:07] <mfa298> generally for a radio transmitter to be legal is needs to be designed by someone competant for that purpose. [15:07] <mfa298> exactly what's legal will depend on location. [15:09] <mfa298> the way radio signals are generated on the Pi is a hack using one of the clock signals so isn't designed in any way. [15:11] <ShapeShifter499> "the hell you doing kid? to much interference from your place"
[15:12] <mfa298> as to how quick, and what happens that would likely depend on what you're interferring with. [15:13] <mfa298> If you've taken out a runway at a major airport you could get the knock within hours (as I think has happened). If it's not affecting anyone it might take months/years for anything to happen. [15:15] <mfa298> I tihnk there are a few projects doing updated versions of that code. [15:16] <mfa298> and if you're suitably knowledgeable and licensed you can potentially use it in a legal way on some radio bands. [15:17] <gordonDrogon> the issue is that that's right in the middle of broadcase radio frequencies in most countries - a range that requires a license to Tx on. The tiny transmitters to hook stuff up to the car radio get away with it due to their ultra low output power - technically still illegal without a license. You have no power control over the Pi output ... it's not tiny and not very well tuned. Generally a bad idea. [15:18] <gordonDrogon> so I'd suggest it's of academic interest, but no more than that. [15:18] <mfa298> just because they're using a transmission you can't decode doesn't mean you can't interferre with it. [15:19] <mfa298> In the UK the radio transmitters for use in the car are only legal if the power is something like 50nW (yes, nano) and they'll have been designed not to have nasty harmonics all over the place. [15:22] <ShapeShifter499> has there been any confirmed cases of a Rapsberry Pi causing too much interference in this manner? [15:23] <gordonDrogon> there have been reports of people being able to hear it on their radio 2 streets away - so that powerful enough to cause interference all over the place. Get some noise in the 118Mhz+ range and you start to interfere with air traffic - that 'won't go down well. [15:24] <gordonDrogon> really don't do it. [15:26] <ShapeShifter499> so is there anyway I might accidentally trigger interference doing other pi projects? [15:26] <ShapeShifter499> as long as I'm not messing with clock signals? [15:27] <gordonDrogon> it's also hard to accidentlaly write to the clock control registers without the magic super secret password. [15:28] <gordonDrogon> although right now it can only set a clock pin to a max. of 19.2Mhz. [15:34] <ShapeShifter499> mfa298: gordonDrogon so if this is so nosy and powerful to the point of possibly knocking services out in an area, why did the flip did "Make" feature it? [15:35] <ShapeShifter499> also their design looks too much like an explosive, what were they thinking? [15:38] <gordonDrogon> they printed it to sell copy. [15:40] <mfa298> it also takes some radio knowledge / advanced maths to really understand how bad it can be in terms of being noisy. [15:41] <ShapeShifter499> gordonDrogon: "they printed it to sell copy." sorry? [15:41] <gordonDrogon> Make is a magazine - the sell paper and digital copies and charge money for it. like most subscription magazines do. [15:42] * gordonDrogon sighs. millenials. [15:43] <mfa298> although as it's a hack, knowing what makes a suitable dummy load becomes more challenging. I doubt the gpio is acting like a normal 50ohm source. [15:49] <ShapeShifter499> gordonDrogon: I know Make. Question is, this article made it to print? [15:51] <gordonDrogon> I've no idea and I don't really care. I stopped paying for Make a good number of years ago. [15:53] <gordonDrogon> let us know how you get on making it ..
[16:02] <gordonDrogon> I ought to get some batteries for my PC1211. [16:03] <kaosine> gordonDrogon: schools still use ti's and I never upgraded past my ti-84 silver I got like 6 years ago I think? [16:05] <gordonDrogon> intersting. not sure UK schools ever used programmable calcs. [16:06] <gordonDrogon> I got a Casio fx501p when I left school - it was good for some of the numerical analysis we were doing at the time. [16:08] <gordonDrogon> what age if you don't mind me asking? I can never work out when school stops & uni starts if not in the UK. [16:09] <gordonDrogon> graduation is typically leaving university in the UK. [16:19] <gordonDrogon> the issue us the number of signals required. [16:19] <gordonDrogon> more than a Pi has, so you'll need some sort of gpio expanders(s). e.g. mcp23017 - which gives you 16 more. [16:23] <kaosine> gordonDrogon: wait, even if I mange to use a 3 b+? [16:30] <gordonDrogon> Rickta59, no issues. they sold sam adams boston lager in the old colonial inn, which was acceptible. [16:31] <gordonDrogon> Rickta59, 20 years ago. [16:38] <gordonDrogon> can't you just copy the carts. to an SD card then load the images into the Pi? [17:00] <thpar> Hi all! Anyone experience with the Adafruit 7-segment display? I got it working nicely on a Pi 3, using it from Python3, but just now it stopped working: "RuntimeError: Could not determine default I2C bus for platform." [17:02] <gordonDrogon> thpar, can you see it with i2cdetect? [17:05] <gordonDrogon> if the device in your program is 0x70 then you can see the device on the I2C bus. [17:05] <gordonDrogon> which is generally good. [17:13] <thpar> which would mean hardware is still ok? [17:15] <gordonDrogon> it means that the Pi can detect the device on the I2C bus. [17:16] <gordonDrogon> what did you update? the kernel or system in-general? [17:17] <gordonDrogon> and the quality? [17:19] <gordonDrogon> thpar, sorry - i've no idea what dnf is. [17:20] <gordonDrogon> thpar, oh, well, good luck there then. as for rpi-update - again, that's for bleeding edge kernels. not something I'm personally keen on. [17:20] <gordonDrogon> can you go back to the last table kernel? [17:20] <thpar> gordonDrogon: that doesn't sound very encouraging. Thanks for the help anyway! [17:21] <thpar> gordonDrogon: minimal Fedora install here. [17:23] <thpar> gordonDrogon: right. Maybe I should just put this SD card aside and quickly go for a clean Raspbian install. [17:24] <gordonDrogon> thpar, notmally in the raspbian world, apt-get update/upgrade will pull a new stable kernel when the foundation kernel warblers are ready to release it. 4.4 is still their stable one and 4.9 is in testing, but there may yet be issues with it. [17:24] <gordonDrogon> it's tricky if you've been using Rh/Fedora for the past 15 years though. [17:25] <ShapeShifter499> is there any non-standard hardware on the Raspberry Pis? Anything that upstream Linux arm kernel can't use? [17:27] <gordonDrogon> ShapeShifter499, no idea. you'd probably be better off asking in more kernel related areas I suspect. [17:27] <gordonDrogon> Arch was minorly popular a while back. [17:28] <gordonDrogon> if you can get it with a foundation 4.4 kernel then there's no reason it won't work. [17:30] <funabashi> hi guys, which dist is "best" ? [17:32] <ShapeShifter499> I have a couple of small plug computers that I screwed up flashing. A Pogoplug and a Dockstar They might be revived if I get a serial connector, but I don't really have to worry here. [17:37] <gordonDrogon> thpar, yea, Debian since more or less day 1 of Debian here, so I understand the issues. [17:38] <leftyfb> funabashi: though if you're asking, I'd say stick with Raspbian. [17:38] <gordonDrogon> funabashi, raspbian has the most/best support. [17:39] <ShapeShifter499> or am I missing something? [17:44] <ShapeShifter499> Are there any plans to release another Raspberry Pi Zero with more ram? [17:46] <gordonDrogon> not that we know of. [17:47] <gordonDrogon> I've a funny feeling the SoC doesn't support any more RAM but I might be wrong there. [17:47] <gordonDrogon> it's also good to keep it low power though. Lots of people are liking the low power aspect of it. [17:47] <redrabbit> what is filling the 512mb on yours ? [17:49] <ShapeShifter499> I could be wrong but it could help out with some emulators, maybe native compiling, etc. [17:51] <mfa298> for compiling you can always add swap, or use a better speced board to do the compile on. [17:52] <gordonDrogon> I compiled the full LAMPy thing on the first Pi v1 I got. It didn't swap. It did take 10 hours though. [17:52] <gordonDrogon> ShapeShifter499, yes. 2K. Although some of that is used for the CPUs registers though. [17:53] <gordonDrogon> ShapeShifter499, consider this for a moment... Who are the people who write code for microwave oven controllers that have less RAM? [18:05] <gordonDrogon> thpar, ah, grand! [18:08] <Lartza> Is raspbian still on 4.4 kernels and not the 4.9? [18:11] <gordonDrogon> I don't think it's a big deal for 99.999% of the users though. [18:12] <gordonDrogon> yes - it's the one you'll get with rpi-update. [18:15] <ShapeShifter499> well I'm going to head off. [19:10] <funabashi> anyone got issue with installing teamviewer.deb ? [19:20] <redrabbit> is it a bad idea to use magnets around a rpi ? [19:22] <redrabbit> is it a problem for battery cells ? [19:32] <gordonDrogon> chrome on your old iphone is optimised to use hardware graphics. [19:32] <gordonDrogon> on the pi, it isn't. [19:32] <funabashi> what browser can i use ? [19:33] <redrabbit> do you run pixel ? [19:33] <gordonDrogon> oq, hacktually ... from what I gather it's a set-top-box SoC trying to run a full desktop os. AIUI, that's why it's lacking in a lot of the low-power stuff. The actual ARM part might be generic though. [19:35] <gordonDrogon> funabashi, I run Kodi on a Pi v3 and it seems just fine for that - youtube, 1080p videos, HD TV an stuff. [19:35] <funabashi> kodi is just a program/tool no? [19:35] <gordonDrogon> Kodi is just a program, yes. [19:35] <gordonDrogon> it's a large suite of programs that do set-top-box type of stuff. [19:36] <gordonDrogon> the Pi can be used as a desktop, and some do use it as such, but you just need a little bit of patience. [19:36] <gordonDrogon> I still use my old Atom Acer Aspire One - with 1GB of RAM and it's about on-par with the Pi. [19:37] <funabashi> how can i optimize ? [19:40] <mnemonic> archlinux-ARM is faster than raspbian? [19:40] <gordonDrogon> if it is, it would only be by a percent or 2. [19:41] <gordonDrogon> hm. maybe if they compile it specially for the v3 it might. [19:41] <mnemonic> and what of two have more apps in repository available? [19:41] <gordonDrogon> raspbian is compiled to run over all Pi's. [19:44] <gordonDrogon> why do you think this? [19:46] <gordonDrogon> doing lots of scientific stuff/number crunching might give you an advantage, but the Pi isn't exactly the PC for that stuff anyway. [19:47] <NedScott> isn't all processing technically number crunching? [19:48] <gordonDrogon> worth a read about 32 vs 64. [19:56] <brainzap> what about the camera that posts pictures of the in progress to instagram? [20:15] <Psi-Jack> Rickta59: Heh, though that board looked more like an odroid. [20:28] <sponge-tmp> i'd like to use my raspberry as a playable device for spotify. but somehow the key library is deprecated... any ideas how to still get it working? [20:29] <Psi-Jack> Heh. Just get an Amazon Echo which has that natively supported, and is about the same price as a Pi? [20:31] <Psi-Jack> Heh. Well, because you'll have problems. Spotify on Linux is commonly not supported and broken or breaking. It will be a PITA to maintain it. [20:37] <Psi-Jack> Oooh nice, The new HDMI to VGA adapter I got works WAY better than the other one I had. I had a j5create, replaced it with a Rankie, and it just syncs better to the VGA autosync. [20:46] <sockofleas> and when i run it in the terminal like usual, it works just fine, printing to screen and logging and all. [20:47] <Psi-Jack> sockofleas: Stop using cronjobs to run services. Use systemd service units. [20:48] <sockofleas> can you clarify that? [20:48] <Psi-Jack> That IS clarified. [20:48] <Psi-Jack> systemd is the init system on most distros these days, including Raspbian. It's what starts and stops services. [20:49] <Psi-Jack> Custom systemd service units usually go in /etc/systemd/system. System-wide units are usually in /usr/lib/systemd/system/*.service, so you can use those as a reference, then google systemd.service for documentation. [20:53] <sockofleas> Psi-Jack: can you link me a guide to learn how to set this up? [20:53] <sockofleas> also, why exactly is it bad to use cronjob? [20:53] <gordonDrogon> not all Raspbians have systemd. [20:54] <gordonDrogon> sockofleas, if might be better off launching it from /etc/rc.local than cron though - if you want to be traditional about it. [20:54] <Psi-Jack> Well, Raspbian Jessie does, because it's based on Debian Jessie, which Debian Jessie comes with systemd. [20:54] <Psi-Jack> sockofleas: Because that's not what cron is for. [20:54] <brianx> is there a current variant of raspbian that doesn't? [20:54] <Psi-Jack> cron is to run scheduled chronological tasks. Not services, especially long-running ones. [20:55] <Psi-Jack> gordonDrogon: Your running an old raspbian. [20:56] <gordonDrogon> I intentionally removed it. Why are you calling me stupid? [20:56] <brianx> gordonDrogon: and what did you do to get a jessie without systemd? [20:56] <Psi-Jack> I didn't call YOU stupid, just the action was stupid. [20:56] <gordonDrogon> I take it as a personal offence. [20:57] <gordonDrogon> Psi-Jack, so you're saying I should not have a choice? [20:57] <Psi-Jack> But, I didn't call the person stupid, just the act of removing systemd was stupid, in my opinion, personal and professional. [20:57] <brianx> so all current raspbian come with systemd, but it is possible to remove it. the OP does not seem likely to have done that. [20:57] <Psi-Jack> sockofleas: I already have. [20:57] <gordonDrogon> sockofleas, easy way: put the start commands in /etc/rc.local and use full paths. [20:58] <brianx> sockofleas: Psi-Jack's recommendation is the better one. [20:58] <gordonDrogon> only better if you use systemd. Not everyone uses systemd. [20:58] <brianx> sockofleas: it matches the current and near future plans for debian better. [20:59] <Rickta59> "raspbian how do i add an init script to systemd"
[21:01] <brianx> the OP is not all that likely to be a corner case. they don't seem to have the skills to implement things that are significantly non-standard. [21:02] <gordonDrogon> me too. I test in /etc/rc.local, then write a /etc/init.d script for it. [21:02] <brianx> /etc/rc.local works today but is the old method. [21:03] <gordonDrogon> it's nice to have a choice. [21:03] <brianx> when you dig into systemd, it becomes a bunch of small unix-ish utilities again. [21:04] <brianx> my biggest issue is storing the log data in a binary format. [21:05] <brianx> parsable plain text would have been my preference. [21:06] <Psi-Jack> you can still get that by hooking in rsyslog to it, which distros like CentOS does by default. [21:07] <Psi-Jack> I like the fact, though, that I can natively look through the journal logs and even search for time and day and various filters to see if those logs exist and what they had. [21:07] <brianx> iirc, that breaks the status feature. [21:08] <Psi-Jack> systemd is already feeding an alternative syslog for that very purpose, by default, whether or not anything is using it. [21:09] <brianx> so two disk writes for every systemd related log entry. [21:10] <Psi-Jack> The syslog virtual device is not written to disk. [21:11] <brianx> meaning the only disk copy is again a binary format? [21:12] <Psi-Jack> Generally, by default. The output /run/systemd/journal/syslog is a socket that other things, like rsyslog, can read, and do whatever you want with. Write to a file, or ship it to another system, etc. [21:13] <brianx> so CentOS keeps one copy of the systemd related logs on disk and that copy is in a binary format? [21:14] <Psi-Jack> Correct. CentOS also keeps the traditional /var/log/* logs files received via rsyslog, by default, as well. [21:15] <brianx> this is consistent with my understanding but adds another output interface to the log viewer that i wasn't familiar with. [21:18] <brianx> it still leaves me without the diagnostic ability that not using a binary format would. if my pi won't boot and i only have an amiga or anything else handy (one with an sd slot), i could read text only logs with that. my amiga can't read the binary format logs. [21:19] <brianx> i'm generally fairly happy with systemd, except for the binary log format. [21:20] <Psi-Jack> You can technically also configure systemd not to write much, if any, to that, or disable it, and just use rsyslog with it. [21:20] <Psi-Jack> This is nice. This Photon, easy to tinker with up front. [21:25] <brianx> iirc, you can also code that thing with gcc Psi-Jack. it may not be as easy to get a silly demo up with, but it's great for doing something more complex. [21:25] <Psi-Jack> I know you can also reflash it with something other than tinker. I'm not a C programmer, but I can certainly learn. [21:25] <Psi-Jack> sockofleas: And using cron to run "services"
[21:25] <Psi-Jack> That's a big no-no. [21:38] <brainzap> what does it do? [21:41] <brianx> it's nice that it's an STM32 Cortex M3. much better than the esp8266. 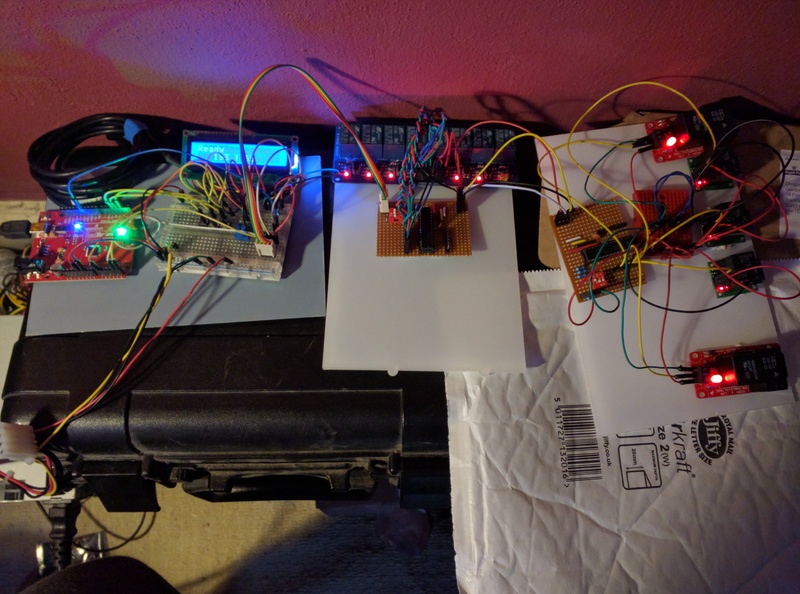 [21:41] <Psi-Jack> I'm just prototyping and getting my hands dirty now, but I'm designing a RPi-3 HUB to work with and communicate with external WiFi modules, like this Photon, to be door sensors, motion sensors, etc. [21:42] <Psi-Jack> brianx: Yeah, I have two other modules that use the esp8266, the Adafruit HUZZAH and HiLetgo NodeMCU. [21:42] <brianx> it's not nice that it costs almost 11 times as much though. [21:42] <Psi-Jack> 11 times? Nah, just twice. [21:43] <brianx> Psi-Jack: where did you find a photon for $3.64? [21:45] <brianx> Habbie: it's a much more robust design without the requirement to link a binary blob for access to the radio and the module plus cpu model means no long delays while the cpu can't be interrupted during transmits. [21:46] <brianx> Psi-Jack: i was comparing to an esp-12. [21:50] <Psi-Jack> Nice. My little Anker flashlight, I just made a little photosensor that sends event logs when it detects a certain light level. My flashlight has a bright mode, eco mode, and flashing mode. [21:51] <Psi-Jack> Soon, I will tinker with it with a real PIR sensor. [21:58] <Psi-Jack> The one thing I was concerned about the Photon was that I didn't want to be externally dependant on a service with it, because I'm building a security system. [21:58] <Psi-Jack> Aka, I want the RPi3 itself to directly be able to receive events over the local WiFi for things happening, when I build the server code for it,. [21:58] <brianx> of course you can build into various cloud services with it, but you can also implement lots of things without the cloud. [21:59] <Psi-Jack> Pretty powerful, and fast. [22:00] <brianx> just wait till you get tired of the silly scripting language and move on to C.
[22:02] <Psi-Jack> brianx: Heh. This may be my gateway into C/C++, finally, actually. [22:02] <Psi-Jack> What language IS the Photon stuff in anyway? It looks C-like, but mostly looks similarish to the wierd statemachine based C I used to work with on older JackModules. [22:06] <Psi-Jack> Looks like it's kinda Arduino-like. [22:09] <Psi-Jack> And Arduino functions as well, so Arduino code will run natively. Interesting. [22:12] <brianx> i'm not sure what they call it. [22:12] <brianx> arduino is not quite C.
[22:13] <Psi-Jack> Particle uses their language called "Wiring", which is based on the same code framework as Adruino. [22:16] <Psi-Jack> But yeah. This is cool stuff. [22:16] <Psi-Jack> "Why you should not use a Raspberry Pi for Home Security". "Because it's not linked in with a monitoring service, and because we want to sell you our own service and equipment" is literally all it boiled down to. [22:27] <mfa298> I think there are some that would argue learning C before C++ just leads you into bad habits. [22:28] <mfa298> you might be better learning the bits of C you need as you learn C++ if you want to go that route. [22:28] <Psi-Jack> Heh, yeah. I'm more prone to learn C++, because it's more my primary focus, that and Node.JS. Since C++ would also help me towards programming a Qt/KDE application for all this. [22:30] <Psi-Jack> Blah... I guess later I'll have to solder on those pin rails to that HUZZAH. [22:32] <mfa298> Habbie: I'm the same, I started with C and then moved to C++ and did a lot of things the C way. It's only after reading some bits of C++ tutorials I've started to learn that there are often better ways in C++. [22:32] <mfa298> But ignoring all that old knowledge is hard, and I find trying to work through decent learning courses frustrating when I already think I know a lot of it. [22:34] <Psi-Jack> Habbie: So, what you're saying is... It's better to outright learn C++, than it is to simply learn C, then add on C++? [22:35] <Psi-Jack> Lua makes you happy? Interesting. I haven't done Lua yet, but it's on my list, especially since the HiLetgo NodeMCU uses LUA by default. [22:36] <brianx> i thought the default was something like node or lua. if it's arduino, that's close enough to C.
[22:36] <Psi-Jack> Oooh, micropython.. I might have to look into this! [22:36] <Psi-Jack> I do know Python! [22:37] <Psi-Jack> Yep, There's ESP-8266 shields out there. [22:38] <brianx> Habbie: i'm aware. but using esp8266 under arduino leaves you with a window size of one. the result is blocked code and poor wifi performance. [22:38] <brianx> Habbie: yeah, it's apparently being worked on now. maybe soon there will be a fix. [22:38] <Psi-Jack> Habbie: OH! Interesting. [22:39] <Psi-Jack> You mean the actual chip itself, like on the Arduino UNO WiFi. [22:39] <brianx> Psi-Jack: loving my UAP-AC-Pro. just got one. [22:39] * Psi-Jack cringes about Java. [22:39] <NineChickens> Does rm -rf nuke the entire filesystem? [22:40] <Psi-Jack> brianx: Hehe. Yeah. Lite was enough for me, and half the price, paired up with 2 covers my whole house extremely well, plus my whole yard. [22:40] <brianx> Psi-Jack: have you tried the debug terminal yet? i've not been able to get mine to connect. [22:40] <Psi-Jack> brianx: Hmm? debug terminal? [22:41] <NineChickens> so type 'rm -rf.'? [22:41] <brianx> Psi-Jack: devices, choose device, configuration, debug terminal. [22:41] <NineChickens> Is the . meant to be the filepath? [22:41] <Psi-Jack> NineChickens: Do you have a real question, or just a bunch of nonsense jibberish? [22:42] <shauno> you may want to use -ri rather than -rf if you have no idea what you're doing. --interactive vs --force. [22:42] <Psi-Jack> brianx: My debug terminal works. [22:42] <NineChickens> shauno: Would they have similar effects? [22:43] <brianx> Psi-Jack: what os are you running the controller under? [22:43] <NineChickens> And just -r? [22:44] <Psi-Jack> brianx: Heh. I'd just ssh in anyway, same thing. [22:44] <brianx> running latest firmware and latest controller. [22:44] <brianx> oh, ssh works just fine. [22:44] <Psi-Jack> Yep. I actually upgraded from UniFI Controller 4.x (stable), to 5.x. [22:45] <brianx> Psi-Jack: i didn't know the debug terminal was nothing but the linux shell. thanks! [22:45] <Psi-Jack> brianx: Yeah, it's literally just a NoVNC-like terminal shell to the WAP. [22:45] <Psi-Jack> brianx: Same thing you'd get with ssh, exactly. [22:45] <brianx> Psi-Jack: maybe that was it. i installed 5 directly without ever installing 4. [22:46] <Psi-Jack> The only thing the Debug console does different is, well, it's in a web page, and two, it's a white background with black text (ewww), and three, it's in a fancy HTML movable window within the page. [22:46] <brianx> heh, all not interesting to me. [22:46] <Psi-Jack> And it's not even 80x25, it's 80x10? [22:47] <brianx> now, i wonder how much of the config i can manage through the shell... i'd love to not have a silly "controller"
[22:47] <gordonDrogon> you could have just moved it ? [22:47] <Psi-Jack> That should tell you something. [22:48] <brianx> yeah, i'm in the shell. it seems to be a reasonably standard micro distro based on busybox utilities. [22:48] <Psi-Jack> Heh, and the "help" command, shows you so little... info, set-default (factory reset), set-inform (URL for UniFI Controller), upgrade (firmware url), and reboot. [22:49] <brianx> the availability of tools to manage the ap in the shell are what i'm curious about. set ssid, passwords, channels, run an rf scan, etc. [22:50] <Psi-Jack> brianx: It IS good to know though that ip link shows athX devices, meaning it's Atheros, not Broadcom crap. [22:51] <Psi-Jack> brianx: Funny too. Seems these UAP's have an httpd on them. uhttpd. They just seem to not be running it. [22:52] <gordonDrogon> NineChickens, what's up now? [22:53] <Psi-Jack> He lacks basic linux knowledge. [22:53] <brianx> Psi-Jack: hadn't noticed that. interesting that uhttpd is installed. [22:53] <brianx> the pro is Atheros too. [22:54] <Psi-Jack> But, isn't running it, again..
[22:55] <brianx> almost as if they were planning on adding the ability for these things to become routers instead of just AP. [22:55] <brianx> or maybe they use common code with some router product. [22:55] <Psi-Jack> With only 128MB RAM, maybe not. [22:55] <Psi-Jack> Probably able to work with the overal USG stuff, maybe... Just maybe. [22:55] <brianx> i've never had a home router with more than 64MB ram before. [22:56] <brianx> it's the 16GB flash that's painful. [22:56] <Psi-Jack> However, I /do/ wonder what makes these UAP's accessible from the iOS/Android app. [22:57] <Psi-Jack> brianx: Heh. Sheash. My ER-X for $50 has 256MB. My ERPOE-5 though just replaced that and has 512MB RAM. [22:57] <oq> Habbie: you build it yourself? [22:58] <Psi-Jack> I've considered soooo many times building my own router. With stuff from pc-engines.ch, it would be cheap to do. [22:58] <Psi-Jack> Habbie: Nice. Exactly what I was just talking about. [22:58] <gordonDrogon> I build lots of stuff based on the ALIX boards. nice little boards. [22:58] <brianx> this is the first fairly modern device i ever bought. [22:58] <gordonDrogon> *built - don't do it any more. [22:58] <Psi-Jack> Habbie: That'll be one of my next purchases down the road, just to have one to play with. I want to understand coreboot first hand. [22:59] <Psi-Jack> That's what I hear. [22:59] <gordonDrogon> currently I use Atom boards for my home/office routers. [23:01] <Psi-Jack> Anyway, stepping away now. The hunger has become real. [23:04] <Psi-Jack> Hehe. I want to see if it's possible that with the PIP me and my wife could be both playing PS4 and Wii-U at the same time on the same TV. [23:06] <Psi-Jack> Yeah, my living room TV, the only TV I have these days, is a 56"
[23:06] <mfa298> when buying electronics it pays to look around a bit and choose your time carefully. When I got my TV (quite a few years ago now) it was cheaper to buy a 40" tv rather than a 32"
[23:09] <gordonDrogon> our last TV was free as I'd done some work for the shop... however it was a 36" Sony tube. last of their kind. it needed 2 people to lift it. [23:18] <Guest53867> gordonDrogon, not the last of it's kind, I have one in my living room now. [23:19] <gordonDrogon> I did manage to get rid of it recently - we were offered some big flatscreen thing for next to nothing because it was the wrong colour for this persons house. [23:20] <gordonDrogon> it now has a Pi connected to it running Kodi. [23:20] <gordonDrogon> it's actually the first time we've taken "technology" into the living room. [23:21] <gordonDrogon> there's no ethernet in there, so it's using wi-fi. [23:21] <Psi-Jack> Heh. grrr.. Just as I was ready to get to other things... Work happends, on the f'ing weekend.. Again..
[23:24] <scott_tams> has anyone here set up a pi to take a remote signal from a PC (either windows or linux)? [23:24] <mfa298> my parents house is good if you want something to be technology free, it's Edwardian and half the walls are at least a foot thick. [23:24] <gordonDrogon> we have no technology in the bedroom. [23:25] <scott_tams> I mean, I have a Nexus 6, at arms length that's basically big enough to be a TV anyway so why would I need any tech in the bedroom? [23:27] <gordonDrogon> most phones do, I suspect. [23:27] <scott_tams> what makes the n6 a notably good alarm clock though? [23:27] <gordonDrogon> it's all I have, so it's good. [23:27] <gordonDrogon> actually, I have an N5 too, but that's for spare. [23:27] <scott_tams> oh i see. fair. [23:28] <gordonDrogon> I gave up on separate alarm clocks, watches, etc. decades back. [23:28] <scott_tams> Yeah I remember using my Palm Zire 21 as an alarm clock at...10, maybe? [23:29] <gordonDrogon> actually, I'm trying to think what alarm clock I had before mobiles... I started with the original Nokia communicator (brick) thing. [23:31] <gordonDrogon> I for it for my 18th birthday and must have kept using it until then. [23:31] <scott_tams> Oh my that's so nice! [23:32] <gordonDrogon> 30 years give or take. [23:33] <gordonDrogon> they don't make them like they used to. [23:34] <scott_tams> Hence why I wish we had more open-source hardware. [23:37] <redrabbit> for the "has anyone here set up a pi to take a remote"
[23:37] <gordonDrogon> the buttons went on my old clock. I couldn't make it change the time or alarm. [23:38] <gordonDrogon> my bbc micro blew the PSU capacitors recently. [23:38] <gordonDrogon> check the capacitors on old stuff - they do fail. [23:38] <mfa298> my bbc still seems to be fine, although the cub monitor with it when pop after I plugged it in a couple of months ago. [23:39] <scott_tams> redrabbit, how did you do it, just rdesktop or something else? Did it work well? [23:39] <gordonDrogon> there's a few people selling capacitor kits on ebay to repair the PSUs in the Beeb. [23:40] <scott_tams> ssh over x works for me, I've done that before, but my roommate runs windows. Will rdesktop be fast enough for him do you think? [23:42] <gordonDrogon> vnc can be faster than ssh/X due to lack of encryption. [23:43] <gordonDrogon> tightvncserver is what I use. [23:43] <gordonDrogon> it's not the network, it's the Pi's compute ability to do the encryption. [23:44] <mfa298> redrabbit: mobaxterm is only free if you don't do much with it. [23:51] <scott_tams> You can use SSH to show Windows 7 windows in the X window system on debian?? [23:51] <scott_tams> or that 5900 thing?? [23:52] <scott_tams> wow that would probably be ideal.